The Food of a Younger Land by Mark Kurlansky (Riverhead Books, member of Penguin Group, New York, 2009), reviewed here this past summer, is A Portrait of American Food before the national highway system, before chain restaurants, and before frozen food, when the nation’s food was seasonal, regional, and traditional- From The Lost WPA Files (as noted on its title page). Arranged geographically, the food items described are a mix of signed and unsigned contributions by participants in the 1930s Federal Writers Project. One American food item, which dates back to the 1620s, and is rooted in the much older culture and traditions of the American Indians of (what is now) Rhode Island and southeastern Massachusetts including the Narragansett Indians, is known as Indian Flint Corn (with its hard kernels). Described by the WPA writers, Henry Manchester and William Baker (cited by Mark Kurlansky) as a species of corn hard as flint . . . not colorful and produces a fine white corn mean that is known . 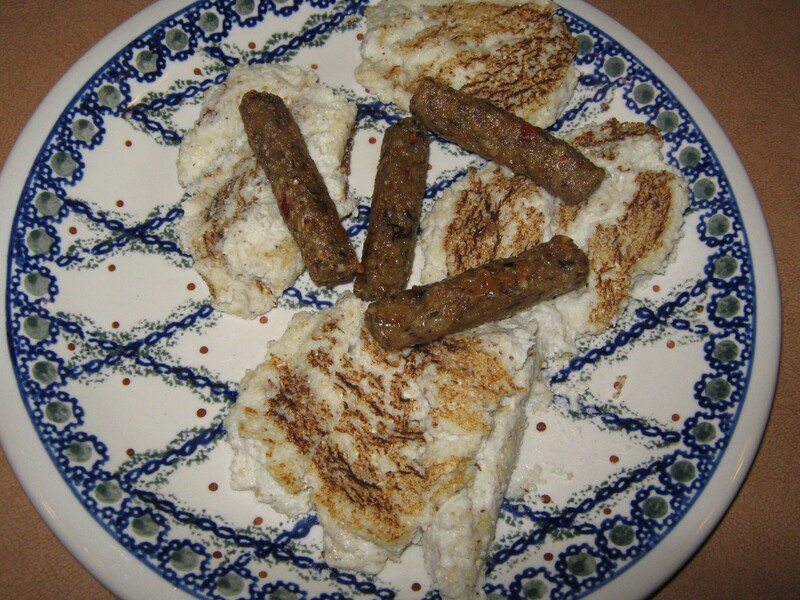 . . as jonny cake corn meal. Gray’s Grist Mill, located in southern Massachusetts on the Rhode Island border, and one of the oldest continually running grist mills in New England (with a mill operating on the site since 1675), describes in its handy brochure how the Pilgrims who landed at Plymouth in November, 1620, were in desperate straits: The wheat they had brought from England has all spoiled during their long voyage. Luckily, Miles Standish discovered a cache where the Indians stored some of their harvest of corn. According to the story handed down over the centuries and related in the grist mill’s brochure, the corn was a grain unknown to the Pilgrims, but Squanto, a Patuxet Indian who was friendly toward them, taught hem how to pound the corn into a meal with a crude mortar and pestle and then how to mix it with water into a stiff dough which was spread on a small flat surface and stood before an open fire and cooked into a sort of cake. 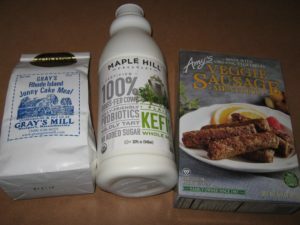 This home cook suggests that a holiday gift of Jonny Cake Corn Meal from Gray’s Grist Mill (whose granite stones have been turning out Rhode Island Jonny Cake Meal for over 300 years) and a copy of Mark Kurlansky’s wonderful book would be perfect for anyone appreciative of real food rooted in American history. And what a fun way to spend time in the kitchen with younger family members to make your own jonny cakes hot off the griddle. The recipe provided by Gray’s Grist Mill is as easy as can be, though the griddle must be well-greased. This cook used 1 and 1/2 cup of kefir milk, instead of the suggested water and 1/2 cup of milk. Using Maple Hill Creamery’s plain kefir from 100% grass-fed cows resulted in mildly tangy and delicious jonnycakes. 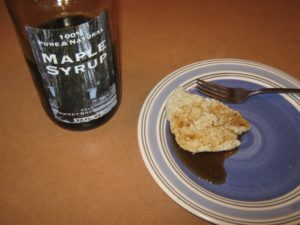 I also omitted using any sugar, though topping one of the mildly tangy jonny cakes with maple syrup turned out to be a tasty and sweet ending to the meal. The jonny cakes cook fast and tend to stick to the griddle unless it is well greased. 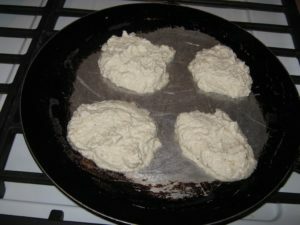 Only two to three minutes, each side, over low heat should be sufficient- like cooking up pancakes.